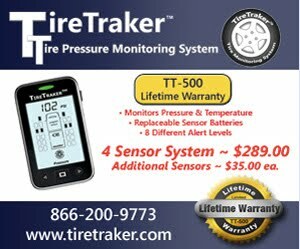 RV Tire Safety: Is your TPMS warning psi set correctly? I use the TireTraker, and it has a 25% OVER-pressure alert function. Therefore, if I were to set the alarm at 75 and CIP to 85 (for example), I'd get an alert at 94 -- which is easily hit after warming up. So I need to set my alert to my CIP when using this particular product. I can't speak to any other TPMS systems in this regard. Fortunately, 15% down is my first pressure-loss alert, which gets my attention at 73psi, well in advance of the "danger zone". I have my Tireminders set high because I get high pressure warnings when they warm up on the road. I figure it really isn't as much about the pressure setting as it is about the change in pressure. High pressure warning at CIP +25% which should be high enough. Remember it is the low pressure that can kill tires.